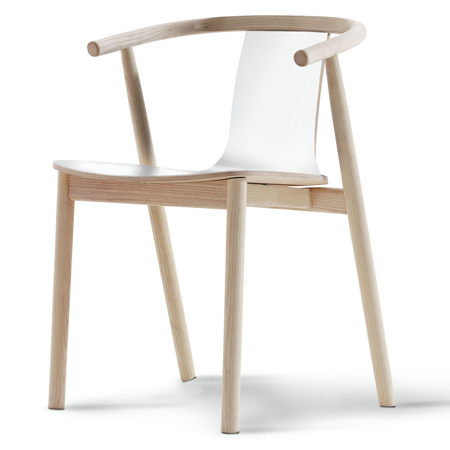 British designer Jasper Morrison has designed BAC, a wooden chair for Italian brand Cappellini. Launched in Milan last April, the ash and plywood chair follows the BAC table Morrison designed for the brand in 2005. Morrison has also added a round version of the BAC table (below). Twenty years after designing the Thinking Man’s Chair, Jasper Morrison, has still managed to astound the world of high design with Bac, the new chair in solid ash wood and plywood. The frame is available in bleached, wenge tinted, or cherry red aniline tinted ash wood. The seat is available in diverse variations and has the same finish as the frame with upholstery in leather or white, brown, grey or black linoleum with an ash wood back. The chair combines perfectly with the Bac table series but can easily compliment many other items from the Cappellini Collection as well. The Bac table series is enriched with new items and new finishes. In addition to the two current rectangular versions, the series today introduces a round version. All elements of the collection are now available with table tops in clear glass, white, brown, grey and black linoleum or in natural or wenge tinted ash wood.